I must say- it was LOVE at first use. I like using Leave-in conditioners because I have frizzy hair and they defy gravity for at least a day after I shampoo, which makes me look like a frizz monster. For the longest time I had been searching for a good leave-in conditioner that helps my hair settle down but doesn’t Weigh them down and also because in winters the hot water runs out and when I have the conditioner to my hair, it feels cold (lol). The ends of my hair are dry and I needed a serum or conditioner that would add some density to it to look sleeker. 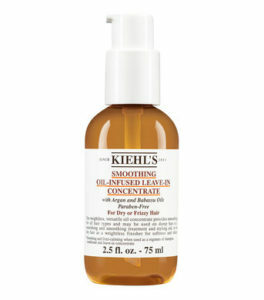 Thankfully, my search is over and I found this amazing product on one of my visits to the Kiehl’s store in Elante Mall, Chandigarh. made it shine and sparkle! made it Baby soft and for the first time my daughter touched my hair and said “aapka Baal ache hai” (this compliment means more to me than someone telling me “aapka makeup achha hai” because I KINDA KNOW IT ALREADY! Ha ha ! The ends look heavier and SO does the scalp. I applied the product from to half the length of my hair to a tip and a teensy bit on the top. The hair looks wavy instead of frizzy. Pro Tip- Applying on wet hair will give you a better result as compared to applying on dry hair.